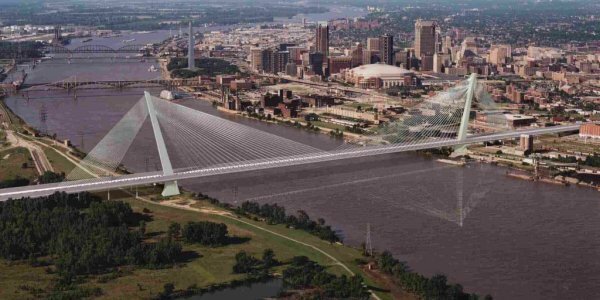 ST LOUIS - Work on the new $700 million Mississippi River Bridge north of downtown St. Louis could come to a halt next week. East St. Louis Mayor Alvin Parks and the Metro-East Black Contractors Organization announced their plans for a protest on Friday, September 16, aimed at temporarily shutting down construction. Authorities say Alvin and MEBCO want more minority participation in the project, especially for black workers. According to the Illinois Department of Transportation, the state agency has exceeded minority participation guidelines with minority workers making up about 35 percent of the total workers on the job as of August 29, and accounting for 23 percent of the man hours worked on Mississippi River Bridge. An IDOT spokesman tells local sources that 85 percent of those minorities come from the Metro East. Local reports say the Parks and MEBCO are demanding that minorities make up 50 percent of all workers. Negotiations between IDOT and MEBCO broke down last week. Now the black contractors are calling for a protest September 16 and hope to get Governor Pat Quinn and other local leaders to join them in their effort.